Emergency Rally: Defend Venezuela’s Popular Democracy! No coup! No foreign intervention! Imperialist Hands Off Venezuela! En nombre del Círculo Bolivariano Louis Riel quiero expresar nuestro agradecimiento por todo el trabajo realizado ayer que permitió que nuestro evento en apoyo a la Asamblea Nacional Constituyente en Venezuela fuera un absoluto éxito. La actividad se llevó a cabo en un ambiente impregnado de alegría, optimismo e entusiasmo lo cual reflejaba que algo muy bonito estaba pasando en Venezuela y asi fue, mas de 8 millones de venezolanos estaban diciéndole al mundo que estaban decididos a vivir en paz, con dignidad, en un pais soberano y liberado de cualquier yugo imperial. Lamentamos que la oposición venezolana e internacional haya subestimado al pueblo chavista pensando que llevando al pais a la extrema violencia y destrucción iban poder doblegarlo. Tampoco nosotros, como dijo el Presidente Maduro, podemos subestimar la capacidad de maldad de los grupos fascistas que han invadido al pais para perjudicar la Revolución Bolivariana, es por eso que es necesario mantenernos en alerta porque se ha ganado una batalla pero la lucha continúa hasta que alcancemos la victoria. Viva el Bravo Pueblo Bolivariano!!! Peace, Sovereignty, and Democracy in Venezuela, Brazil, and Colombia. Join us for an evening of art, music, poetry and dance weaving together different themes into an interactive cultural show of solidarity. Music willincludes Brazilian artists, Zeca Polina and Mari Palhares, Mohammad Ali @socialisthiphop, Pablo & Ernesto Latin American musicians, Dj siez swift, and many more artists. A decade ago a tide of progressive governments, defying Washington and its neoliberal polices took power across Latin American and the Caribbean through democratic means. Today that tide is receding and Latin America is shifting towards more conservative neoliberal governments closely linked to Washington. This has led to an increased militarization of the region, support for right-wing coups and return to neoliberal austerity policies. In Brazil the Senate approved neoliberal labour reforms never before seen on the continent that seek to push back workers’ rights for generations. These policies are being imposed through state violence as the Armed Forces were recently used to repress massive street protests clamouring for the resignation of defacto president, Temer. In Colombia months after signing a historic peace agreement and the FARC rebels turning in all their weapons yet paramilitarism and violence against social movement leaders is on the rise. More than 156 social leaders were killed in the past 14 months. The United Nations said Colombia’s government was undermining the country’s peace process by failing to release imprisoned FARC members and protect disarmed guerrillas as promised. In Venezuela, U.S imperialism aligned with violent local elites are trying to overthrow the democratically elected government of Nicolas Maduro. For the past three months, the opposition has undertaken constant and violent street protests that have resulted in the deaths of over 100 people. The international media with its biased coverage of the conflict in Venezuela is fueling a possible civil war. The Chavistas have responded with a proposal for peace, through a democratic and participatory Constituent Assembly. On July 30th Venezuelans will elect representatives to help write a new constitution that will determine the path forward for their country. la capacidad de daño de la oposición"
Defeat the Imperialist Conspiracy Against Venezuela! Like so many friends of the Bolivarian Revolution across Canada and around the world, the Canadian Peace Congress is alarmed at the intensifying campaign being orchestrated by the privileged monopoly circles within Venezuela and by their imperialist sponsors internationally – including Canada – to foment economic chaos and political violence to make the country ungovernable and bring about a reactionary coup d’état. If the attempt at internal counter-revolution fails, plans are being put in place for direct military intervention by the United States, possibly under the cover of the Organization of American States (OAS). This of course is not the first time internal reaction and its foreign backers have attempted ‘regime change’, but this is the most concerted, all-sided assault ever. The right-wing forces are taking advantage of the increasingly difficult economic position facing Venezuela, arising from the sharp decline in world prices for oil resources, the export of which generates most of Venezuela’s hard-currency earnings. For the past several months, US imperialism and its allies domestically and internationally have been exacerbating Venezuela’s economic difficulties by attacking its international credit rating (making foreign loans increasingly expensive), by weakening the foreign exchange value of the national currency through purposeful speculation, and by withholding basic commodities needed by the people (but whose distribution is still controlled by private monopolies), such as milk, coffee, rice, oil, and basic necessities like toilet paper, toothpaste and medicines. The intention of this economic warfare is clear: to create shortages and imbalances in the domestic economy and to increase the misery of working people in the hope of eroding popular support for the Maduro government and for the Bolivarian Revolution as a whole. This economic ‘softening-up’ of Venezuela – very similar to the imperialist tactics used against the Allende government in Chile before the Pinochet coup of September 1973 – has been combined with a campaign of increasingly violent protests in Caracas and some other urban centres. Armed thugs mingle with other civilian protesters and launch violent attacks on security forces, especially after sunset. Schools, childcare facilities, hospitals and food banks have also been ransacked. Finally, the enemies of Venezuela are using various diplomatic venues such as the OAS to undermine internal support and international solidarity with the Bolivarian Revolution, spreading lies about ‘brutal repression’ against ‘unarmed pro-democracy protests’ by the Maduro government. Canada has played a particularly shameful role in whipping up this propaganda offensive against Venezuela in the OAS. 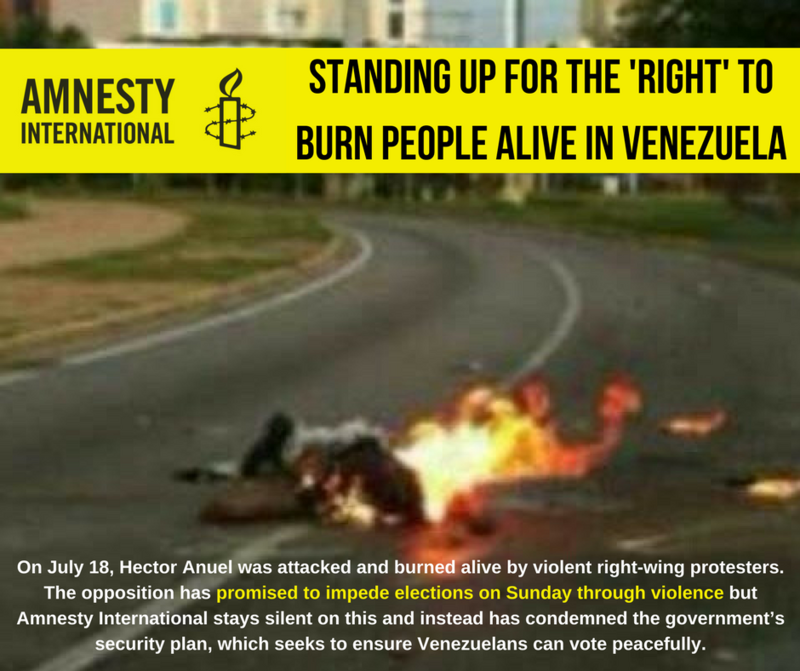 For its part, the Venezuelan government has been very restrained in its response to the increasingly violent provocations from the right-wing forces. Instead, it has come forward with a proposal to form a new Constituency Assembly – composed of elected representatives from throughout the country, and from all sectors of society, including workers, peasants & farmers, indigenous communities, women, youth & students, religious circles, business, and the political opposition – to develop a vision and constitutional framework in line with the wishes of the vast majority of the Venezuelan people. The domestic right-wing forces, and the imperialist circles backing them, have viciously denounced this proposal for a new Constituency Assembly, precisely because it would demonstrate incontrovertibly that the majority of the people back the Bolivarian process first elaborated by former President Hugo Chavez Frias. That is why they are desperate to overturn this proposal before it can take flight. This Sunday, July 30, the elections for the Constituency Assembly will take place, and the right-wing opposition are gearing up to make these elections impossible to conduct. Failing that, they will denounce them as “undemocratic”, as a prelude to a violent overthrow of the government and the seizure of power. In such circumstances, it is absolutely vital that progressive and peace-loving people and organizations across the country speak out now against this impending coup d’état. We urge everyone to be on the alert, and move quickly to organize emergency actions and protests in such a catastrophic event. The Canadian Peace Congress and its members and supporters will reach out and work in unity with all those in defence of the Bolivarian Revolution, and against imperialist interference or aggression under any guise. Este 30 de julio en Venezuela se da una batalla con repercusión en todo el continente Nuestro Americano y los movimientos populares no podemos quedarnos inmóviles. La Constituyente es la herramienta democrática para defender y promover la paz frente a los sectores fascistas internacionales y locales que intentan violar la autodeterminación de este pueblo libre y soberano. Una Herramienta para defender y profundizar esta revolución que viene dando batalla hace 19 años. La constituyente no solo es un freno a la violencia fascista y lacaya, sino que es un ejemplo de empoderamiento popular, una expresión del pleno ejercicio de poder de la gente que participa, discute y decide el rumbo del país, pueblo bravío que junto a su presidente Nicolás Maduro vienen librando heroicamente una guerra multidimensional de cuarta generación creada en los laboratorios golpistas de la CIA. En momentos difíciles como los que estamos atravesando en toda la Patria Grande, donde los amigos y aliados de antaño, de las épocas victoriosas, saltan la cerca para criticar desde la abstracta pureza, los movimientos populares del continente seguimos hombro a hombro defendiendo la revolución bolivariana. Sabemos muy bien que es en estos momentos cuando los pueblos demuestran sus más grandes gestos libertadores, y no tenemos dudas de que los y las venezolanas lo vienen haciendo, nos toca a los pueblos hermanos seguir denunciando las barbaridades de la derecha fascista que nunca saldrán en los grandes medios, nos toca movilizarnos para demostrar que el proyecto bolivariano sigue ardiendo en nuestros corazones, nos toca asumir la Constituyente en cada porción de tierra del Avya yala. Porque Venezuela es el corazón de este momento histórico, allí late el proyecto de integración revolucionario para lograr la segunda y definitiva independencia, decimos que “Venezuela es el corazón de América”. Se hace imprescindible que podamos llevar el ejemplo de este proceso a todo el continente para que la próxima Constituyente sea para fundar la nueva institucionalidad de la Patria Grande, plurinacional, descolonizada, feminista y socialista. Diversas organizaciones y personalidades políticas y sociales de Argentina seguimos levantando las banderas del Comandante Chávez, nos solidarizamos con el pueblo venezolano y defendemos el gobierno legítimo de Nicolás Maduro. Es por todo esto que lanzamos la campaña “Venezuela Corazón de América“y convocamos a todas las organizaciones y movimientos de la Patria Grande toda a manifestarse en apoyo a La Constituyente a través de manifestaciones en la calle, con actividades, creaciones artísticas y culturales. También llamamos a dar la batalla en las redes sociales, escenario de disputa y creación de matrices de opinión para el provecho de la estrategia imperialista.